In a few words, explain what this site is about. GoodKitchen.org provides valuable kitchen appliance reviews as well as recipes for lean lunches, savory suppers, delectable desserts, and everything in between. Your one stop information site for everything kitchen and food related. Love Starbucks Coffee Cake? This version is even better. Tender, buttery cake topped with crunchy crumbles and a cinnamon-sugar ribbon running through the middle. Pour yourself a cup of coffee and dig in! 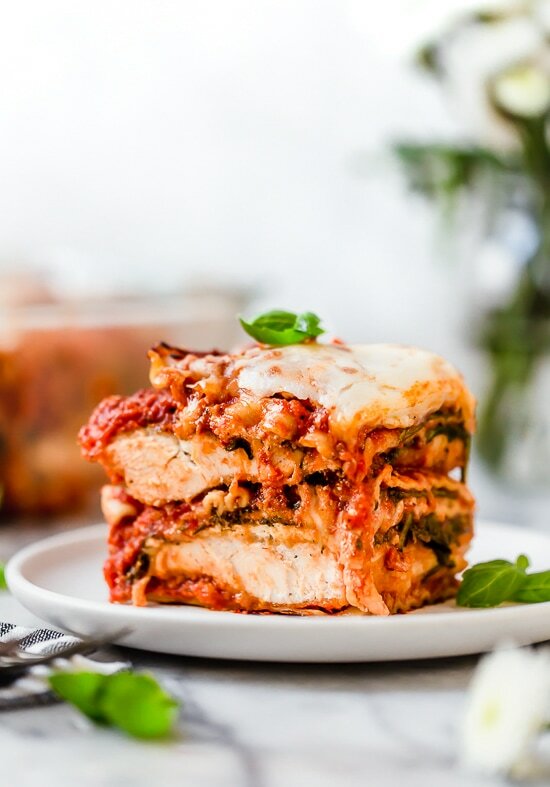 I combined two of my favorite foods – Chicken Parmesan and Lasagna to make this delicious Chicken Parmesan Lasagna, the perfect family-friendly dish to feed a large crowd! You’re going to need a really deep baking dish to make this!! This extra deep lasagna has 5 layers of noodles (I used no-bake), with two layers of breaded chicken cutlets (yeah baby!) in between all that saucy, cheesy goodness! This recipe is sponsored by Land O’Lakes, Inc. I have been WAAAITING like a patient person to share this recipe with you, and my day has finally come. Or is it your day? Our day? Please welcome into your life: Carrot Cake Coffee Cake. I know it might be confusing – carrot cake, which is like vegetables meets cake, but also still cake, combined with coffee cake, which is also cake but the kind you can eat for breakfast and it will still be totally appropriate and, obviously, cakey? But no need to be confused. HELLO! Meet your one true match. This one is for you. Here’s how we make it (IT’S VERY EASY). First: I hate grating things, especially carrots. I’m not even sorry. Put me on the record. I said it. So, I am not going to make you grate anything! Just run your peeled carrots through the food processor, and if you don’t have a food processor, what are you even doing? You need this post. Next: mixing up a very simple batter with eggs, flour, sugar, cinnamon, and (wait for it) butter. Carrot cakes traditionally use oil. But newsflash: BUTTER IS DELICIOUS. So today we use butter. Obviously. Land O Lakes® Butter is my butter of choice – super creamy, rich, perfect amount of saltiness – honestly, I don’t even have to tell you that it just makes everything taste better. Also they are our neighbors here in Minnesota. Yay for carrot cake, yay for Land O’Lakes. Now it gets baked under an aggressively thick layer of streusel. The crumbly topping is just barely crunchy, and the honey butter shmear gets melty-ish because it’s all still a little warm. You have a coffee in your other hand, and it might just be an excellent little afternoon spring hygge moment for you. Carrot cake coffee cake! I’m telling ya. Prep: Preheat the oven to 350 degrees. Peel and grate the carrots (I use my food processor). You should have about 1 1/2 cups. Cake Batter: Whisk sugar, melted butter, and eggs. Stir in carrots. Add flour, baking soda, and cinnamon. Mix until just combined. The batter will be very thick. Streusel: Mix ingredients for the streusel until you get a texture that looks like pebbles (sometimes I use my hands to mix it all together). Bake: Spread batter into a greased 9-inch round baking pan (see notes). Sprinkle with streusel. Bake for 30 minutes, until the center is just set. Top with honey butter if you’re extra (you are). I used a 9-inch round cake pan, but an 8 or 9-inch square or smaller rectangular baking dish would also work. Honey Butter: Mix 1/4 cup very soft butter with 1/4 cup honey. Spread or dollop on warm slices of carrot cake coffee cake and die and go to heaven. Thank you to Land O’Lakes, Inc. for sponsoring this recipe! The post Carrot Cake Coffee Cake appeared first on Pinch of Yum. 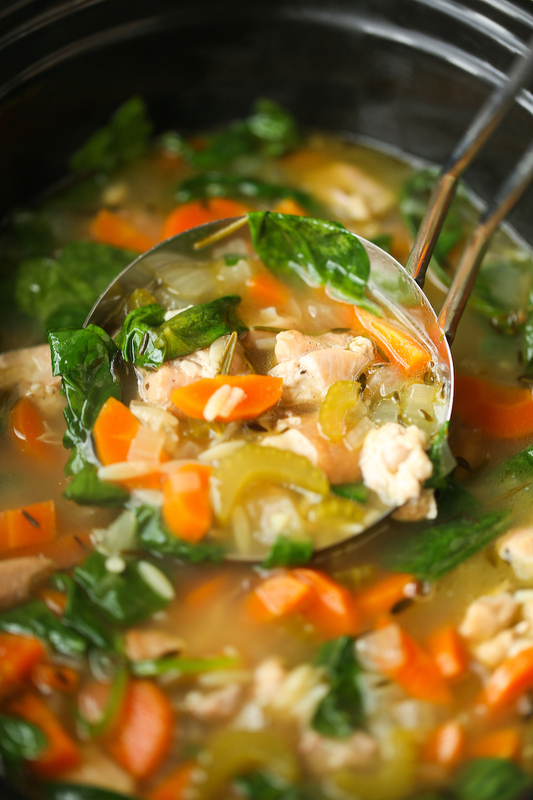 The best kind of comfort food you can make right in your crockpot! Even the uncooked orzo cooks in the slow cooker! So it’s 33 degrees here in Chicago today. With a snow storm, of course. I really started seeing the light at the end of the tunnel. The coffee shops and restaurants started setting up all their patio furniture for outdoor dining. Now they’re all gone. Butters and I braved the snow once today but he quickly scurried back into the house. He was not a fan. So I turned on my crockpot to make the most cozy snow storm soup ever: lemon chicken soup. It’s really the most comforting soup ever, especially with the hint of tang from the freshly squeezed lemon juice and all the hearty veggies. The spinach is not really needed here but hey – any excuse to have extra “hidden” greens, right? I also love how the orzo cooks right in the slow cooker so you don’t have to dirty that second pot. 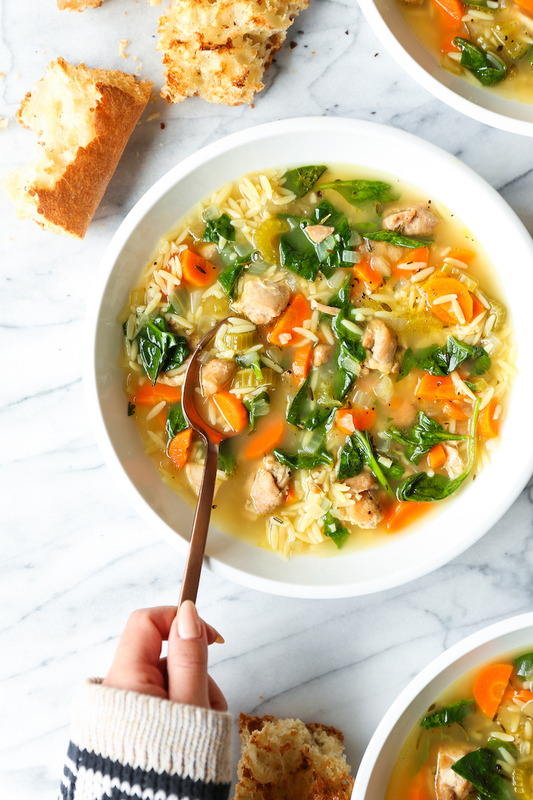 Serve with crusty bread and reload a piping hot bowl of soup as the snow storm (hopefully) comes to an end. Heat canola oil in a large skillet over medium heat. Season chicken with salt and pepper, to taste. Add chicken to the skillet and cook until golden, about 4-5 minutes. 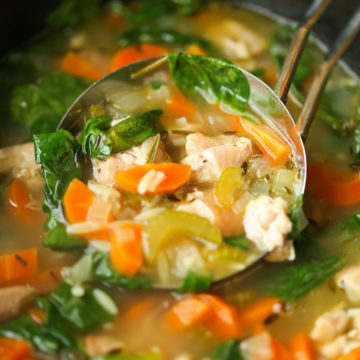 Place chicken into a 6-qt slow cooker. Stir in chicken stock, onion, carrots, celery, garlic, thyme, rosemary and bay leaf; season with salt and pepper, to taste. Cover and cook on low heat for 5-6 hours. Uncover and stir in pasta; cover and cook on high heat for an additional 30 minutes, or until tender. Stir in spinach until wilted. Stir in lemon juice; season with salt and pepper, to taste. Tag @damn_delicious on Instagram and hashtag it #damndelicious. 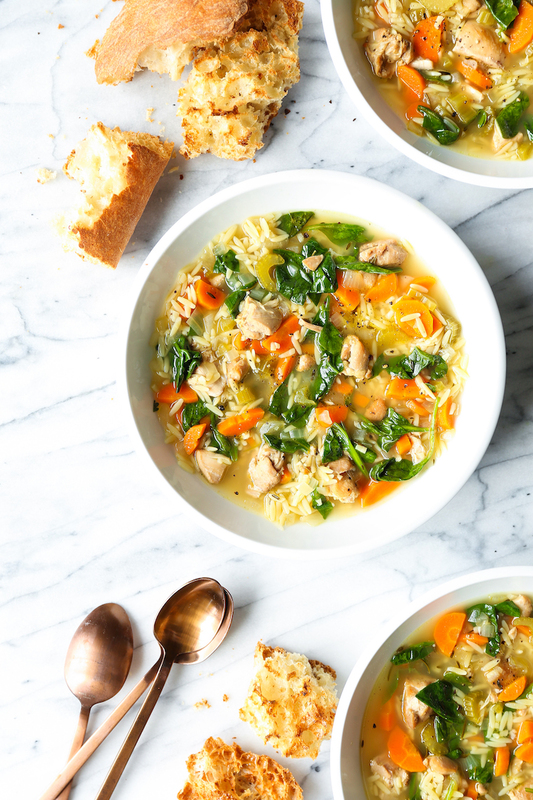 The post Slow Cooker Lemon Chicken Orzo Soup appeared first on Damn Delicious. Here is how to make a perfectly poached egg, every time! With creamy yolks and firm whites, poached eggs are a breakfast on their own. You can also serve them over greens, topped with Hollandaise, in a grain bowl, or dozens of other ways. Homemade beef pho on a weeknight? YES! With a few shortcuts this quick Vietnamese beef pho is ready in under and hour. Searing the beef in a hot skillet also adds great flavor! Have a bunch of greens starting to go wilty? Never fear! Here are ten fantastic ideas for using up your spinach, arugula, kale, or whatever green you have on hand, from sheet pan pizza to frittata.